This is a guide for anyone that uses the services of British Sign Language/English interpreters. You can find everything you need to be confident that you’re booking the most appropriate interpreter support, at the fairest rates, and most importantly – that you can trust. This guide draws on the expertise of interpreters who are currently working in the profession, and is designed for anyone to use. So, whether you work with interpreters on a daily basis, or you’ve just received a request that ‘someone needs a signer’ – this guide has plenty of relevant information to ensure that everyone has the access they need to make communication seamless. If you have never worked with interpreters before – doing so really can be much more straightforward than you might think. 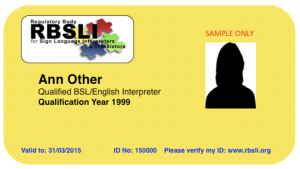 What is a BSL/English interpreter? What do BSL/English interpreters do? How do BSL/English interpreters work? Who might need to use an interpreter? How do you book a BSL/English interpreter? How does it work for Deaf people? Can’t I just use a video service? How many interpreters do I need to book? What information do I need to provide before the booking? How much will it cost to book an interpreter? Interpreter awareness is a commonly overlooked area and as BSL/English interpreters we spend so much of our time explaining to clients the everyday workings of how we work, what we need and why we need it. This pack can support your understanding of why interpreters work the way they do and why they might make particular requests. This can also give you more understanding of areas and situations where you are entitled to BSL/English interpreters. BSL/English interpreters can be found in all walks of life – anywhere that BSL users and English speakers need to communicate with each other. You may be wondering why we use the terms “BSL/English Interpreter” and not just “BSL interpreter” or “Signer”. The “English” is important because the interpreter will not only work from spoken English into BSL, but vice versa when the Deaf person signs. BSL/English interpreters study for approximately 7 years, many to post-graduate level. This includes specific training on the practical skill of interpreting, processing language and managing interaction between a BSL user and a non BSL user. The term “signer” often refers to someone who has an ability to sign in BSL, perhaps even to a level of fluency, but has not had the formal training that interpreters undergo. This Pack is not intended to be a ‘one size fits all’ guide – nor is it intended to be a rulebook. 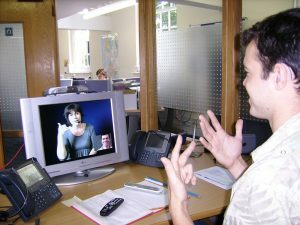 While there are some statutory obligations that organisations, public bodies and other groups have to follow, it is beneficial for all parts of society to do what they can in order to ensure that everyone – Deaf, those who aren’t Deaf and interpreters – receive the access they are entitled to and understand one another. Access to Work: A government fund managed by the Department for Work and Pensions designed to remove barriers to employment for disabled people. read a more detailed definition here. Association of Sign Language Interpreters: A professional membership association for UK-based Sign Language interpreters that supports interpreter development, mainly through a programme of structured continual professional development. For a more detailed understanding of what they do visit their website. One of the indigenous languages of the United Kingdom. Like English, Welsh, Scots Gaelic and Cornish, it has its own distinct grammar and vocabulary. The UK Government does not record census data to provide accurate figures, but estimates range from 77,000 – 150,000 native users of the language, with a further 100,000 having learned the language as a second language. (Source: British Deaf Association) Most of these native users are Deaf although a significant number of them are hearing, as the children and relatives of Deaf people. From 1st August 2016 onwards, all organisations that provide NHS care and / or publicly-funded adult social care are legally required to follow the Accessible Information Standard. The Standard sets out a specific, consistent approach to identifying, recording, flagging, sharing and meeting the information and communication support needs of patients, service users, carers and parents with a disability, impairment or sensory loss. Read the AIS here. An independent, voluntary regulatory body for Sign Language interpreters in the UK. For a more detailed understanding of what they do visit their website. A joint regulatory body and membership organisation for Sign Language interpreters in Scotland. For a more detailed understanding of what they do visit their website. 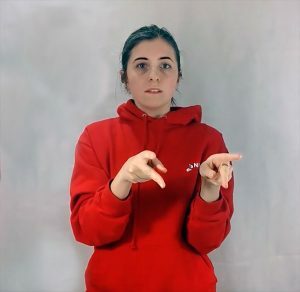 A professional membership association for UK-based sign language interpreters that supports interpreter development, mainly through a programme of structured CPD. For a more detailed understanding of what they do visit their website. 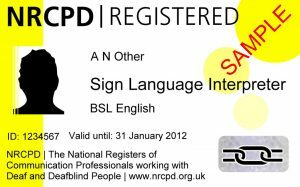 A BSL/English interpreter is a person who holds nationally recognised qualifications in BSL and interpreting theory and practise. They have fluency in British Sign Language and at least one other language (usually English). BSL is a complex and rich language with its own grammar that is independent of English. It is not a derivative of English, neither is it another form of English. Interpreting is the action of listening to someone talking/signing, understanding what that means, and then producing an appropriately equivalent message in another language. Interpreting is different from translation because interpreting is a ‘live’ process that takes place between speakers of different languages, such as at an international conference, or a Deaf person visiting their GP; translation is less immediate and is often linked to the written and recorded form – such as translating the Harry Potter series from English into Hindi. Professional interpreters are fluent in two or more languages, i.e. English and British Sign Lanaguage, and hold professional qualifications in those languages, as well as in the discipline of interpreting. Spoken language interpreters are routinely employed in the European Parliament and its institutions – where interpreting is considered a postgraduate discipline. Signed language interpreters can work between two signed languages (for example British Sign Language and American Sign Language) or, as is more common, between a signed language and a spoken language – as is the case for BSL/English interpreters. This enables them to undertake certain areas of work such as community and workplace interpreting. Trainee Interpreters should not undertake work in Child Protection, Legal or Mental Health settings. 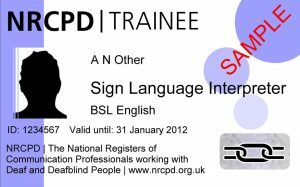 Once qualified, they can then become a Registered Sign Language Interpreter (RSLI) with the NRCPD or with one of the alternative regulatory bodies, RBSLI or SASLI. Sample ID cards for qualified interpreters of two regulatory bodies, NRCPD and RBSLI. NUBSLI recommends only using the services of a regulated Trainee Sign Language Interpreter or Registered BSL/English Interpreter through one of the three regulatory bodies. This gives both the Deaf and hearing client/s reassurance that the interpreter has undertaken the required complex and advanced training, is DBS checked and has the appropriate personal indemnity insurance (PII) in place. Interpreters registered with the NRCPD are also required to undertake and evidence structured and unstructured continual professional development (CPD) every year. If an interpreter is unwilling or unable to provide evidence of their registration, or provides credentials that have expired or that do not match the form of those shown above, they may well be unqualified and/or untrained – this could result in inadequate and inaccurate information being interpreted. The consequences of this can be far-reaching and, in extreme cases, life-threatening. In health and social care, it could mean a Deaf patient (or parent of a child patient) receives an incorrect diagnosis and/or incorrect instructions on how to take medication. In a solicitor’s office, it could result in otherwise crucial evidence being made unreliable in court – or a case being wrongly dismissed before going to trial. For any service provider or public-facing organisation, it is both commercially sensible and legally prudent to ensure appropriate interpreter provision is made for BSL-using clients, customers, patients and service users. Not doing so could mean a breach of the Equality Act 2010. In the most simple form, BSL/English interpreters take a message from a source language, either BSL or spoken English, and reproduce it in the target language, BSL or spoken English. However, the role of the interpreter is considerably more complex and is multi-faceted. BSL and spoken English are not comparable in a grammatical sense and therefore the interpreter must understand not just the words or signs, but the intention, meaning and context to ensure the closest possible message is passed on. A native BSL user can express concepts in one or two signs that take a native English speaker as many as two or three sentences to express. BSL/English interpreters also manage cultural mediation whereby a Deaf and non-Deaf person perhaps have differing experiences of the same situation. BSL/English interpreters often work simultaneously, meaning they are able to interpret what is being said in a matter of seconds, while the speakers are still speaking. This might be in a training session, university lecture or general meeting. While this is generally accurate and appropriately detailed, the nature of the process means it is prone to a margin of error that might need correction and there may be momentary pauses that might sound or look unnatural when compared to conversational fluency between native speakers of any given language. In some situations, interpreters will work consecutively, which means the interpreter will ask each speaker to pause every few sentences, to enable the interpreter to process all that is being said. This often produces more accurate interpretations and is useful where precise detail matters – for instance, at a doctor’s appointment or a solicitor’s meeting. BSL and English are distinct languages with very different means of articulation, and differing sentence structures. 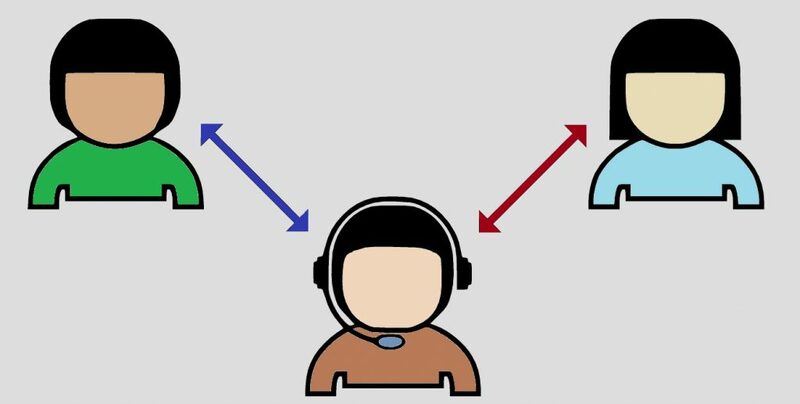 This means that, while some circumstances merit simultaneous interpreting, others are better interpreted consecutively – and it is reasonable to expect interpreters to offer their perspective on which approach to use. Anyone who needs to communicate with someone that speaks a different language. While it seems natural that native sign language users might need interpreters to communicate with those who aren’t Deaf, what is often overlooked is that the reverse is equally true. It is often assumed that sign language interpreters are ‘only for Deaf people’. Interpreters are often presented as ‘helpers’ or as advocates for Deaf people. This is not an accurate or fair representation of the work that is undertaken. Interpreters have a duty of care for all parties, fiduciary duties to everyone they work with, and above all else an ethical responsibility to do no harm. NUBSLI recommend that public sector organisations fully scrutinise the terms of the Equality Act (2010) and, for the NHS, the Accessible Information Standard. This extends to private companies operating public sector contracts. Private companies operating commercially also have some obligations in terms of accessibility and it is worthwhile developing your understanding of the terms of the Equality Act 2010. Read more on the Equality Act 2010 here. More information on the Accessible Information Standards is available here. How do you book an interpreter? 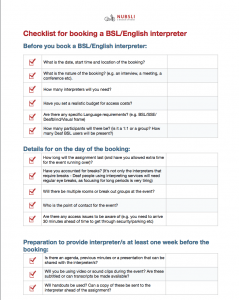 NUBSLI believes that the best way to book a BSL/English interpreter is to book them directly. You can do this by checking the regulatory bodies’ portals, and emailing or phoning them directly. Many BSL/English interpreters work as freelance sole traders. Some have their own websites, and all are locatable on NRCPD, RBSLI or SASLI registration lists. In addition to this, many interpreters network locally and there are many UK regions that have mailing lists, text messaging groups and so on. If interpreters are unable to honour bookings, they have the means to source suitable and reliable replacements. Some areas of interpreting have government framework agreements in place with preferred suppliers under contract, for example Ministry of Justice, NHS and Police. It is important that those working under such framework agreements who supply interpreters ensure that only those with the required qualifications and experience are booked, this is in order to safeguard the Deaf BSL user and ensure a stringent process is in place should something go wrong. Employers, together with other organisations – both in the public and in the private sector – have responsibilities under the terms of the Equality Act (2010) which superseded the Disability Discrimination Act (1995). These responsibilities require all organisations that employ Deaf and disabled people to make reasonable adjustments to their built and landscaped environment, (office layouts, access to the building, toilets and washing facilities etc) and working practices (schedules, routines, meetings, etc) to enable Deaf and disabled people to make the most of their talents. Access to Work (AtW) is a UK Government fund that is administered by the DWP to meet costs that go beyond reasonable adjustments. It can be used to fund necessary changes to building infrastructure, specialist equipment and support workers. The fund is also available to provide BSL/English interpreters, particularly where they are required on a frequent basis where Deaf BSL users and their colleagues who aren’t Deaf need to communicate. Many Deaf people have successful careers because of the provisions of Access to Work. Deaf people often prefer to generate their own ‘pools’ of interpreters, meaning that they use a small group of interpreters for regular bookings. This can be a really good idea as it can develop awareness of organisational culture, and priorities. When interpreters are incorporated and deployed well, they can become a really effective and valuable part of a wider team. However, interpreters should not be expected to take on tasks that should be the responsibility either of the Deaf person or of another member of staff. Where interpreters are supplementing staff in conducting work that cannot reasonably be classified as interpreting, and claim forms are submitted to the DWP for that interpreter’s time, it is likely that a fraudulent claim has been made. Since it is the Deaf person that claims to ATW, they are the ones with whom the interpreter has a contract, unless organisational policies are in place that make alternative provisions. All of this should be established with interpreters before they are booked. Video Relay Interpreting is becoming increasingly popular and is excellent for some situations, including a Deaf person needing to contact their bank, utility company or to make appointments. How do they work? Only the interpreter is in a remote location (such as a A&E doctor wishing to speak to their Deaf patient). A face to face interpreter would be preferable for any other interaction. This is due to the nature of the language and that the whole body is used to convey a message, not just the face. It also restricts the ability for both parties to use points of reference to aid communication. When booking interpreters, NUBSLI strongly recommends that Deaf people play a key part in decisions that are made and that the Deaf person’s language preferences are honoured. Due to the physical and mental demands of interpreting, two or more interpreters may be required depending on the duration and/or intensity of the work involved. Interpreters will discuss this with you at the time of booking. Larger teams may be required in specialist settings, such as conferences and Crown Court. The number of interpreters needed is not related to the number of Deaf BSL users in attendance. Some domains such as child protection meetings or court should always have a minimum of two interpreters to ensure the integrity of the interpretation, as often the BSL/English interpreter is often the only person in the room with access to both languages. For the safeguarding of both the interpreter/s and the clients, two interpreters must always be booked. BSL/English interpreters are also at risk of Upper Limb Disorder, also referred to as Repetitive Strain Injury. More information on ULD can be found here. To ensure that BSL/English interpreters’ health and wellbeing is not put at risk, it is essential to consider whether your session will require one or two interpreters, the best person to advise whether this is the case would be the interpreter themselves. In order for BSL/English interpreters to ensure the best and most accurate interpretation they may require preparation materials in advance to allow them to undertake research needed, such as learning about domain-specific terminology. Interpreters aim to ensure that any dialogue is authentic and flows as smoothly as possible. This includes the use of key terminology and jargon, as well as (in employment related areas) ‘house styles’ and company/organisation-specific protocols. Allowing the interpreter to have sight of any handouts, presentation slides and interview questions in advance can hugely improve the standard of the interpretation and achieve the desired outcome for all parties. It can also be hugely beneficial to have a discussion with the interpreters in advance of the session – and to build in time for Deaf attendee/s the opportunity to do so, at least 15 minutes before the session starts. This also gives the interpreters some time to finalise their understanding of the overall tone of the session, identify key names and locate them to faces, and other essential interpreting decisions. BSL/English interpreters abide by a Code of Conduct set out by the body they are regulated by, this includes confidentiality so you needn’t worry that the interpreter will share the information you give them, it will just aid them in their work. If you have reason to believe that an interpreter is making inappropriate use of sensitive material, discuss it with them in the first instance. If you are unable to resolve the matter, then the relevant regulatory body has procedures in place where a formal complaint can be made. Interpreters generally work in full or half day sessions, however many may have a lower “call out fee” for bookings which are more local or shorter in length. The fee will generally be inclusive of the interpreter’s administration and preparation time, as well as travel time to and from the location. If interpreters are asked to work on weekends, or outside normal business hours (i.e. before 9:00 am and after 5:00 pm Monday to Friday) then additional fees may be charged. We regularly consult with interpreters to get an understanding of the amount that freelance interpreters are charging and you can find a breakdown of those costs by region in the NUBSLI fee guidance. In some exceptional cases where travel is significantly longer, or more expensive (for instance where a London-based interpreter is required for work in Inverness), travel and accommodation expenses may be negotiated. No two interpreting bookings are the same. No two interpreters are the same. As well as using their knowledge and understanding of languages and interpreting, it is also possible that interpreters will be employing their knowledge and understanding of particular specialist domains. As a result, fees for these specialist areas may be higher than standard fees. If interpreters are booked directly, then as a client you can feel secure in the knowledge that this fee is not further inflated with an agency mark-up, and will pay for interpreters with an enhanced specialist skill set. Download our handy checklist to make sure you’ve got everything covered. Our handy guide provides some tips on what to do and what to avoid when you’re using an interpreter. We have seen how vital the role of BSL/English interpreters can be in a range of public and commercial contexts. If you need any more information, or have any questions about what’s in this guide, please contact us using our online form.